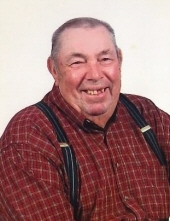 Celebrating the life of James Lamb, Jr.
Obituary for James Lamb, Jr.
James Lamb, Jr., 86 of Crab Orchard passed away Wednesday, March 13, 2019 at his home. He was the husband of the late Irene (Adams) Lamb who preceded him in death on January 18, 2019. James was born in Garrard County on June 2, 1932 to the late James and Ella (Portwood) Lamb. He loved to coonhunt and fish. He cared for and loved his family deeply. He was farmer and a former employee of H. E. Price in the pipeline construction industry. To send flowers or a remembrance gift to the family of James Lamb, Jr., please visit our Tribute Store. "Email Address" would like to share the life celebration of James Lamb, Jr.. Click on the "link" to go to share a favorite memory or leave a condolence message for the family.